I wasted a lot of today trying to clean up files and scripts. The package I was working from was a test package and was named as such, and figuring I was starting to build the level proper, that wasn't really applicable. So I moved my assets over to a new package more appropriately named, deleted assets no longer needed, and so on. Obviously this messed up essential custom scripts, especially in regards to the player pawn, so I had to go trough all the affected scripts and change file paths. Then I tried to tidy up the scripts a bit so that it wouldn't be depending on so many scripts outside my game folder, but I ended up getting nowhere and had to revert back to square one. For some reason I can't get my own scripts to load my mesh, even when I follow tutorials which tell me how to do so. It works fine as it is, I just thought it would be nicer if it was cleaner set up, and mistakenly thought it would be an easy thing to do. Anyway. Much time wasted and no progress made. Also I made a rock. 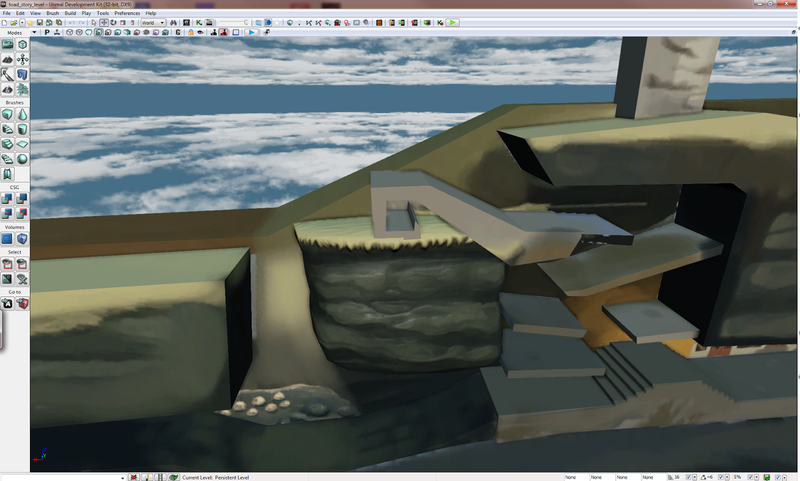 I think my next step should be getting my own skybox in; I can't really get a proper sense of the colours until then.